Some people prefer to work in their homes and of course, would have a home office. Since this is a place where one spends a lot of time in, it would be important for it to look good in order for it to have a good ambiance. But it doesn’t mean that just because it is a work place that it will not look good with some cluttered stuff. It also needs to be aesthetically pleasing. It is also challenging on how you can make your home office look great but we will help you to have a better home office. Since the home office is vital for your work performance, make it look good. You can do that with the ten simple steps we have below. After reading our tips, you can surely have a home office that would make you love working and would also help you become more productive. Take a look at our tips below. 1. Choose a good location. Since you will be spending most of your time in your home office, you have to look for a location that will help you become more productive and that could also make you feel comfortable. Look for a place that is free from distractions and would allow you to work well. It can be a separate room a merely an area in your home. When choosing for furniture, see to it that you are considering its function and not just on how it looks. Look into your work flow so that you can place furniture that you will need to make your work a lot easier. Also, let your furniture complement with the home’s interior design so that it will be coherent with the rest of the stuff inside the home. Since you will be working inside your home for a long time, you would need to bring nature in. You can do that by placing some plants in your office. Choose plants that would also suit to your interior design. Make sure that you will be able to take good care of your plants. You can also place your home office near a window to let fresh air in. You really need to have good lighting so that you can work well inside the house. This will save you from eye strain and headaches. Look for lighting that can aid you with your work. During the day, you can make use of natural light but when night comes, you can try using indirect light so you can still work. You can paint your wall with the colors you love. This can keep you going and will also give you a good mood while working. Colors affect one’s work performance and mood. So, choose those that will good catalyst for better work performance. Aside from that, it can also make your home office look unique and beautiful. 6. Provide good storage space. You won’t find it hard to look for your files and some important stuff for work if you have good storage space. Aside from that, this can also make your office clutter free. Your things have to be kept well and should be organized. You can have some drawers so that all of your things will be away from dust but it will also be okay if you have an open shelf where you can place items that you use most of the time. Inspire yourself by placing some items that motivates you. That could be a framed image of your loved one, a special gift from someone or just anything. This can help you to work better and these items can also give an added beauty to your home office. Since you will be using a computer, printer, phone and other equipments, for sure their cords might be a problem. To make sure that it won’t look distracting and your place will be safe, hide your cords. You can use a plastic or metal cap through a hole in the desk. You can also use cord winders, tubing or other wire organizers. 9. Create a barrier for privacy. There will be different functions for your home office and other areas of the house. To make sure that there will be some privacy, create a boundary. You can use a spare room or if not, your table would be enough to create boundary. A shelf can also be good to separate your area from the rest of the home. 10. Use a space smartly. 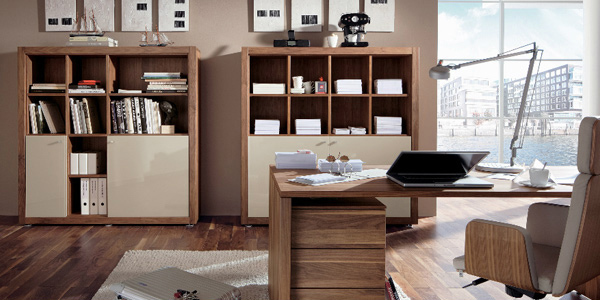 Depending on your available space, you can make your home office look well if you make use of space smartly. If you have a small space, you can organize vertically. Make use of your wall for storage area. You can also use tall cabinets that occupy small space. Having a well design home office would not only be beneficial for your work but will also be an added point in your home. So, see to it that you design your home office according to your needs. It can be located in any area that is comfortable for you. Some place it in their living rooms while others have a home office inside their bedrooms especially if they are into home-based work.